Orlando is a dynamic city to enjoy a honeymoon with its dizzying array of thrilling attractions that appeal to couples, offering easy access to roller coaster-packed theme parks, renowned restaurants, natural hot springs and picturesque beaches. You can keep that wedding glow alive and celebrate your union at one of Orlando’s top hotels that boast beautiful honeymoon suites, where you’ll find luxury amenities and personalized services. Plan a romantic trip for two at one of these ultimate honeymoon suites in Orlando, Florida. Located in downtown Orlando, the Grand Bohemian Hotel Orlando, Autograph Collection is an European-style upscale hotel just minutes from the city’s buzzing nightlife scene and Amway Center, a hub for sports and entertainment. Honeymooners can stay in the Jacuzzi Suite to enjoy a spacious living area, whirlpool bathtub and king-size bed with pillow top mattress. Dine on delectable cuisine at The Boheme or grab a nightcap with soothing jazz at Bosendorfer Lounge, while the luxury Poseidon Spa offers couples massages in addition to body scrubs and facials. Even non-Disney fans love Disney’s Animal Kingdom Lodge, as it’s like stepping onto wildlife preserve in Africa. Wake up and sip your coffee on a private balcony from your One Bedroom Suite as you watch a giraffe casually enjoying his breakfast only a few feet away. Aside from the luxury amenities and fine dining restaurants serving bold flavors from Africa, you can spot exotic animals such as gazelles, zebras and flamingos roaming the lush savannas in what can only be described as the most exotic hotel you’ll find in Florida. A luxury gem in Orlando, The Ritz-Carlton Orlando shares a lush 500-acre property with JW Marriott, offering first-class service and luxury amenities. With an overwhelming amount of activities, you can enjoy the 18-hole golf course, James Beard award-winning restaurant, 40,000 square-foot spa or just relax in the large free-form pool with cabanas. Presidential Suites are well-appointed and come with 5 personal walk-out balconies, spacious living areas, white-marble baths, and views of the resort holiday fireworks. Standing out as one of the most romantic hotels in “The City Beautiful”, the Waldorf Astoria in Orlando is a posh oasis with understated elegance. Couples can have a massage at the Waldorf Astoria Spa, play a round of golf at the Reese Jones-designed course, or indulge in the delectable cuisine at the on-site Bull & Bear. Honeymooners have a range of suites to choose from, including the Presidential Suite with a grand marble foyer, walk-out balconies and luxurious king-size Waldorf bed. Honeymooners will find pure relaxation at the luxurious Four Seasons Resort in Orlando. Award-winning and exclusive, Four Seasons has a dedication to service that is clear from the moment you step onto the property. Spoiled for choices, enjoy its four on-site restaurants, three bars and 13,000 square foot spa. Float your worries away at the lazy river or the adults-only pool, then relax in the Presidential Suite with floor-to-ceiling windows, dining room fireplace and furnished wrap-around terrace. Couples can enjoy the lavish accommodations at the Villas of Grand Cypress, which feel like a world away tucked in a quiet space of Orlando. Here you’ll find 45 holes of Jack Nicklaus Signature-designed golf in the midst of immaculate landscaping and tranquil views of the 1,500-acre award-winning golf resort. Couples can go fishing, boating, bike riding, and swimming, then unwind in a Club Suite with a separate sitting area, Keurig coffee makers, European shower and private terrace with stunning resort views. 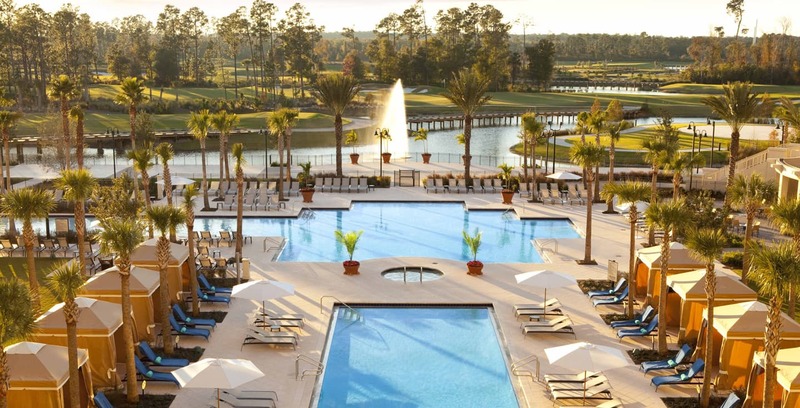 Offering the best of both worlds, Hyatt Regency Grand Cypress offers a tranquil place to relax on its 1,500 acres of private grounds. You’ll find a range of spacious and modern suites to fit your honeymoon needs, while the large sundeck and lagoon-style pool is the hotel’s crown jewel. Swim underneath rock caves in the 800,000 gallon, half-acre pool, admire the 12 waterfalls and test your courage together on the 124-foot water slide tower pavilion. Afterwards, unwind in the One Bedroom Suite with its king-size bed, floor-to-ceiling windows and a separate living area. Couples will love Caribe Royale, as this pink-hued beauty features a massive pool with a tiki bar and several on-site restaurants. Enjoy your honeymoon in a spacious one-bedroom suite with separate living rooms, full-size sofas and flat-screen TVs, then dine in steaks and seafood at The Venetian Chop House. Lounge poolside in a cabana at Calypso’s, spend an afternoon at The Falls Lounge overlooking the pool waterfall or book a massage at The Island Spa. Sitting on 500 acres of beautiful landscaping, JW Marriott Orlando, Grande Lakes in Orlando features seven world-renowned restaurants that cater to a variety of palates with diverse menus that include anything from sushi to upscale Italian and farm-to-table cuisine. Enjoy your honeymoon floating in the lazy river, while you’ll also have access to The Ritz-Carlton Pool in addition to an 18-hole course and three-story spa. Retreat to a Grande Suite with a separate living room, pillow top mattress and mini fridge, or upgrade to the Presidential Suite for a Whirlpool master bath, library and study. Floridays Resort Orlando boasts spacious two and three bedroom suites with Mediterranean decor, full kitchens and private balconies, while the master bedroom’s bathroom has a garden Jacuzzi. Spend time swimming in the lagoon style pool that remains heated at 83 degrees year round, then visit the poolside bar & grill, sandy beach area or therapeutic splash pool. There’s also a grocery shopping service and hot Starbucks coffee served at Palm Cafe. Castle Hotel, Autograph Collection is a great choice for honeymooners, where they can enjoy its luxury boutique accommodations. Take a dip in the heated outdoor pool or grab a drink at Antler’s Lounge, then retreat to your Executive King studio that offers easy access to Orlando’s top attractions. Rest easy with its pillow-top bedding, while it also includes a sitting area, marble bathroom and flat-screen TV with premium movie channels.